An Avio Milano timepiece exemplifies the very best of modern Italian design. Fulvio Locci, the brand’s founder, was convinced that with careful attention to detail and an innovative use of materials, he could create a new line of fine timepieces that would amaze and excite the wearer. The strikingly original Avio Super Chronograph Watch provides some of the best evidence that Fulvio succeeded with his quest for excellence. The Super Chronograph features a revolutionary interchangeable aluminum bezel. Attached to the stainless steel case with four hex screws, this colorful bezel can easily be replaced with a different color by the user. With six different anodized aluminum colors available, it’s almost like having six watches in one. The Super Super Chronograph features a brilliantly designed black dial with stylized white indices. The handsome 44mm stainless steel case features an integrated crown protector and is fitted with a convex antireflective mineral glass crystal. The watch is powered by a premium Ronda 505 quartz movement and is equipped with a sporty black caoutchouc strap that complements the design perfectly. If your moods change, while you’re desire for quality remains constant, you’re definitely going to appreciate the Avio Milano Super Collection Onlytime. This three hand beauty is modern minimalism at it’s very best. You don’t even have to pick a color, because you can have all six. To put this artistic example of Italian design on your own wrist, contact an authorized Avio Milano dealer and reserve your Super Collection Onlytime today. Fulvio Locci, the talented Italian designer who founded Avio Milano, was inspired by the world of aeronautics. Fulvio was fascinated by all aspects of flying and aviation and became excited when he discovered that the high visibility design of helicopter instrumentation had applications for his own timepieces. The result of this interest in helicopter instrumentation was the dramatically oversized Avio 50mm Type 12 chronograph. This spectacular orange monster makes a bold statement on any wrist. 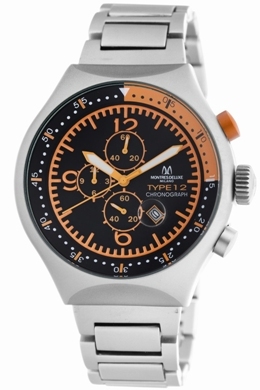 With its jet-black dial and bright orange indices and numbers, this watch is unmistakable. The distinctive black and orange bezel, orange chronograph pusher button, and orange stitching on the attached rubberized black leather band provide further proof that orange is today’s new black. This is not a watch for the faint of heart. Everything about the watch makes a big statement. The 50mm anodized aluminum case is water resistant to 99 feet and houses a premium Miyota OS10 quartz movement that will provide years of reliable service. The watch is fitted with a convex antireflective crystal with an integrated magnifying lens for the date window at 4:30 o’clock. 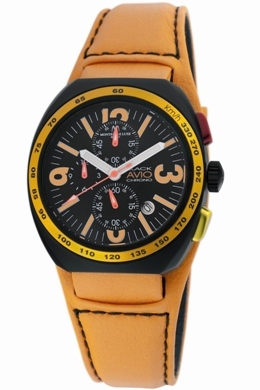 Like all Avio Milano timepieces, the Orange Type 12 Chronograph is designed and manufactured in Italy and carries a two year manufacturer’s warranty. If you’re looking for an over-the-top design that is still under-the-radar for most watch enthusiasts, you can’t do much better than this spectacular Avio 50mm Orange Type 12 chronograph. To start wearing this aviation inspired example of the watchmaker’s art, contact an authorized Avio Milano dealer and reserve your own Orange Type 12 Chronograph today. Avio Milano has a reputation for creating durable and extremely practical timepieces for aviators, divers and other adventurers. Fulvio Locci, who founded the Avio brand, was inspired by the world of aeronautics and his enthusiasm shows. He was determined to create a line of pilot’s watches that was not only practical but was also colorful and fun. 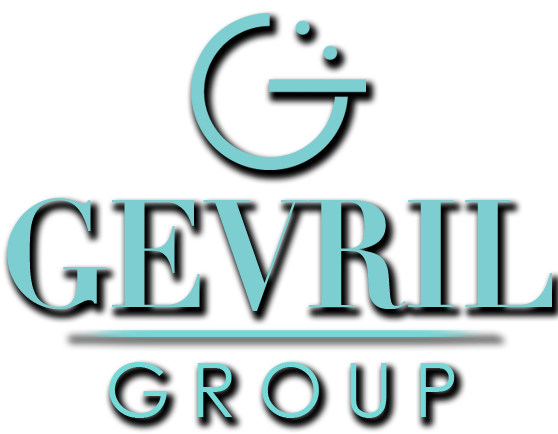 The result of his efforts was the Avio Black Collection. With a case constructed of anodized aluminum, the watch could be large and easy-to-read, without being heavy on the wrist. The strikingly handsome 40mm Avio Black Collection Chronograph features a large, extremely legible black dial with contrasting orange indices and numbers that provide high visibility under even the most adverse conditions. With its bold luminescent white hands, you never have to wonder what time it is. A colorful aluminum bezel is inscribed with a tachymeter scale for calculating airspeed, and three practical subdials that allow you to time just about any event, either in the air or on the ground. The durable aluminum case is attached in the back by four screws and is water resistant to 99 feet. Each Black Collection Chronograph is equipped with a handsome 27mm Lorica and Canvas strap. This modern pilot’s watch is powered by a reliable, high-quality Miyota OS10 quartz movement and comes with a special convex antireflective mineral glass crystal that virtually eliminates glare. Like all Avio Milano timepieces, the Men’s Black Collection Chronograph is designed and manufactured in Italy and carries a two year manufacturer’s warranty. If you’re looking for a bold, unique timepiece that will let your own personality shine, look no further than the excitingly original Avio Black Collection Chronograph. You’ll be proud to have this example of fine craftsmanship and ingenuity on your wrist. 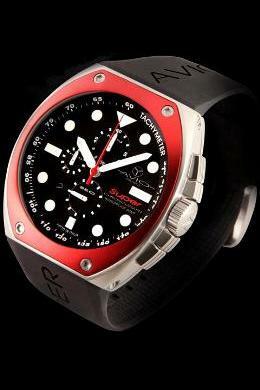 Avio Milano timepieces are available in select retailers around the world.